Easter is the only occasion when lamb is served in Romania: we believe it is a pity to sacrifice the life of such a young animal, and only do it for this special celebration. And when we do, we have a variety of delicacies that use each of the lamb's young body parts, and try not to waste anything. 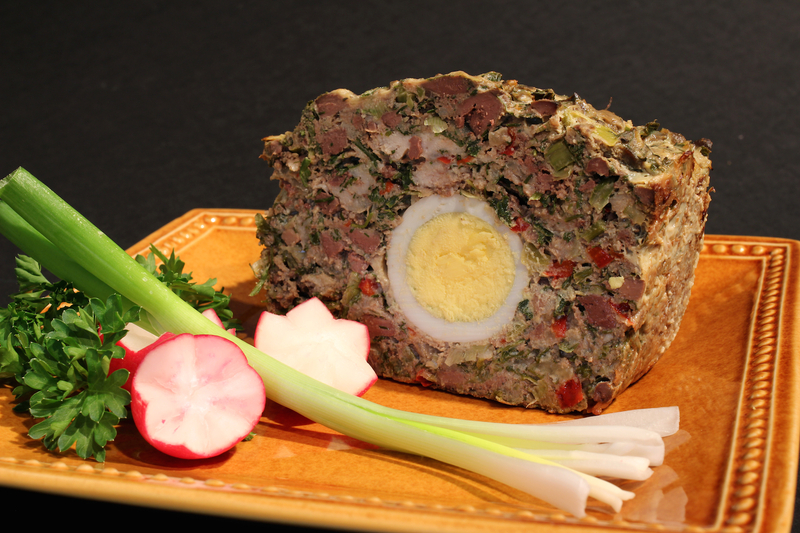 Drob is a traditional Romanian recipe that use the internal organs (kidneys, lungs, liver, and heart) in combination with many greens and spices - it is used primarily as an appetizer, and it is served with bread and usually mustard. As common as it might be back home, it is quite rare to find this delicacy abroad (most likely because finding the necessary ingredients is quite a quest). I give you below a variation of the recipe: same great flavor, but tailored for ingredients that are easier to find. The preparation is a bit time consuming (aside from chopping and dicing a lot of things, two of the items need to be cooked separately, then the whole things is baked for over an hour). I can only say that, if you grew up with this recipe, it certainly reminds you of special Easter celebrations in the middle of your loving family. Enjoy! - Boil three eggs hard (about 10 minutes), peel, and set aside. - Dice the two yellow onions, then fry them in oil until they turn a darker shade of yellow. - Fry the livers on medium heat, until they are dark brown. Do not overcook them, as they would turn hard. Set aside and let cool, then chop into smaller pieces. - Chop the scallions, green garlic, the dill, and the parsley. - Dice the red bell pepper. - Place the chopped livers in a large bowl, together with the ground lamb meat, fried onions, chopped greens, bell pepper, and the remaining six fresh eggs. Add salt, pepper, thyme, and paprika (to taste). Mix until uniform. - Coat a bread loaf pan with oil and a thin layer of flour: this helps the dish from sticking to the sides while cooking. - Place about a third of the mixture in the pan. Add the three boiled eggs, equally spaced (make sure they're not too close to either side). Add the remaining composition on top, and shape everything like a bread. Sprinkle some paprika on top for extra color and aroma. - Cover the loaf pan with aluminum foil, and place on the lowest rack in a preheated oven (400F). Cook for 40 minutes. Remove the aluminum foil, then continue cooking for another 30-40 minutes. - Let cool. Do not cut until it is cold, or the slices might crumble. - Cut into slices, and place on a tray. For extra effect, place it on salad or kale leaves. - Decorate with colorful fresh vegetables: for example, use an selection of cherry tomatoes, radishes, yellow bell peppers, green or red onions, and parsley leaves. - Enjoy with mustard and bread. And, why not, with a glass of red wine.